The Canopy Tower is one of the world’s most unique ecolodges – as a former US Air Force radar tower, its rooms are like no other. 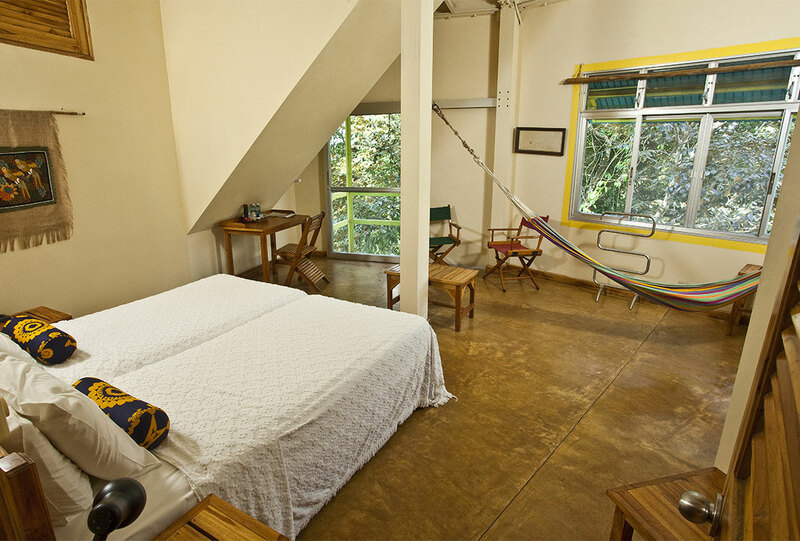 Twelve rooms are precisely arranged on two floors with spectacular views of the rainforest out every window. From single rooms to spacious suites, the Canopy Tower offers options to suit everyone’s slumber desires. Our finest accommodation, the Blue Cotinga Suite, is on the second floor (2 floors above the ground floor lobby), 28 feet high and situated at the canopy level of the trees. 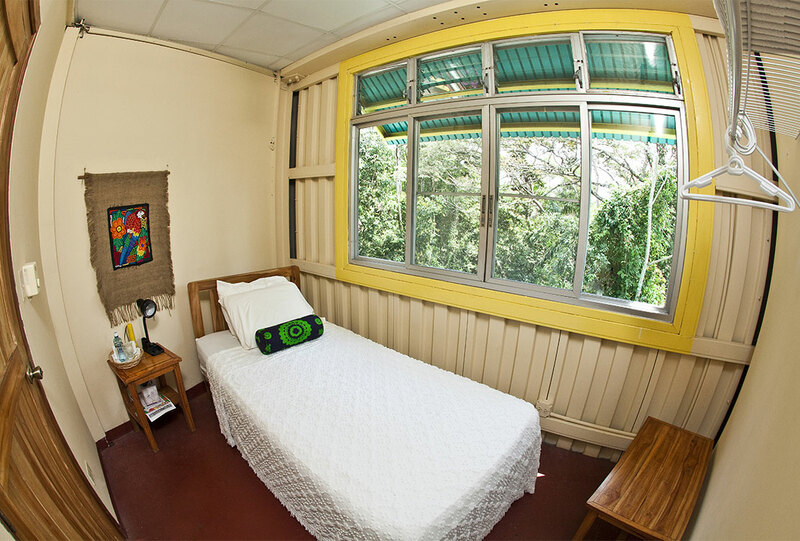 It has an area of 366 square feet, two big windows overlooking the forest, two ¾ beds (which can be joined together to make a queen bed), a desk with a chair, a place to put your clothes/luggage, an overhead fan and a private bathroom with a window. It also has a hammock and a small balcony with a Brookstone hanging chair. This is one of the favorite spots in the Canopy Tower ecolodge. You can see lots of birds real close from your personal balcony and, if you are lucky, see monkeys during the day and kinkajous at night. The Harpy Eagle Suite is located on the first floor (1 floor above the ground floor lobby), 18 feet (5.5 meters) high and situated about mid-canopy tree level. It has an area of 290 square feet, two big windows overlooking the forest, two ¾ beds (which can be joined together to make a queen bed), a desk with a chair, an overhead fan, a place to put your clothes/luggage and a private bathroom with a window. There are five Canopy Rooms on the second floor (2 floors above the ground floor lobby), 28 feet above the ground and situated at the canopy level of the trees. They have an area of 207 square feet, two ¾ beds, a desk with a chair, a big window, an overhead fan, a place to put your clothes/luggage and a private bathroom with a window. Our best room, the Blue Cotinga Suite is also on this floor. 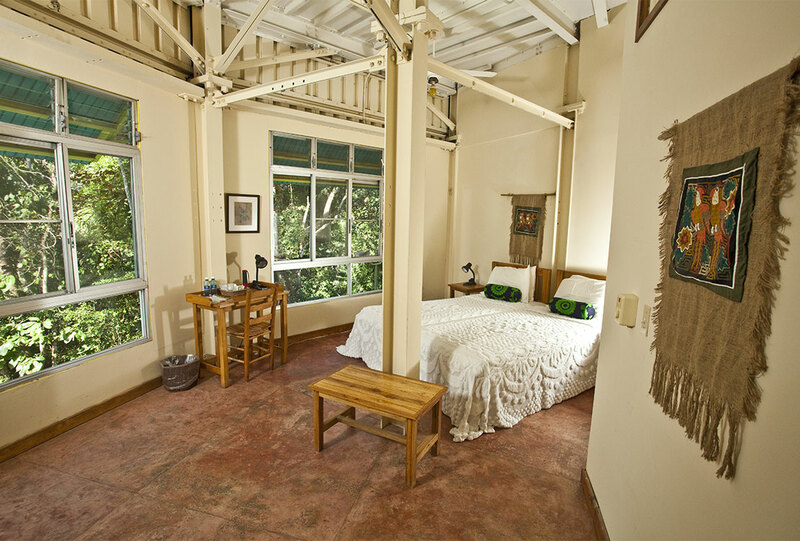 The single rooms are located on the first floor of the Canopy Tower ecolodge (1 floor above the ground floor), 18 feet above the ground and situated at mid-canopy tree level. 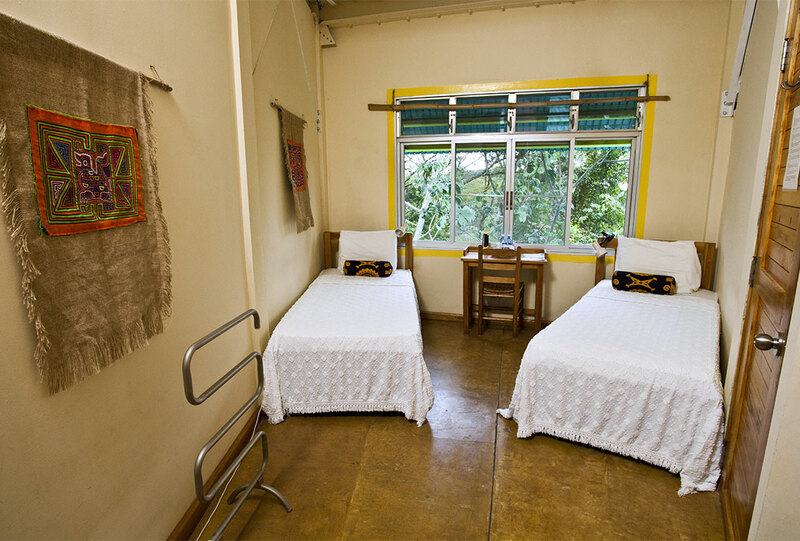 Each room has one ¾ bed, a big window (the same size as the windows of the double rooms), an overhead fan, a night table and a place to put your clothes/luggage. There are five of these rooms sharing a bathroom. Prices are per person in US$ (+taxes), and include lodging, meals, wine with dinner, WiFi, and all tours stated in the itinerary.